The Simms Leather Westshore Slip-On Fly-Fishing Shoe is a Simms leather slip-on fly-fishing shoe that is extremely comfortable and stylish and is really great wear indoor or outdoor, no matter what activity this Simms Leather Westshore Slip-On Fly-Fishing Shoe will keep your feet nice and protected in style and comfort. The Simms Leather Westshore Slip-On Fly-Fishing Shoe is made with Suede leather that comes with a very durable DWR water-repellent finish that is a wonderful aspect of this leather slip-on fly-fishing shoe. 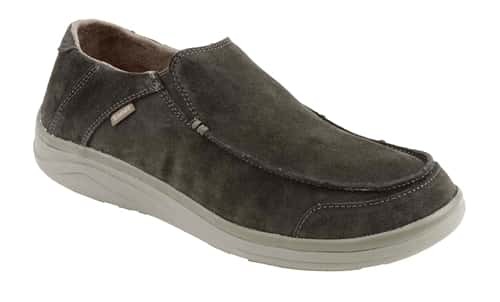 The Simms Leather Westshore Slip-On Fly-Fishing Shoe is extremely comfortable and very stylish and simply comfortable to wear casually too, so make sure to check out this Simms Leather Westshore Slip-On Fly-Fishing Shoe so you can treat your feet with a really nice and comfortable shoe. Jump off the boat, head straight to the bar to pick up the ladies!